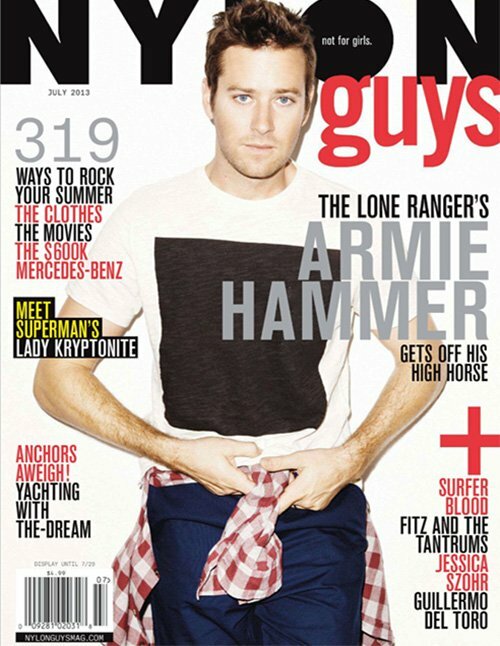 Social Network hunk Armie Hammer covers the June/July issue of Nylon Guys magazine. Here is what Arnie had to share with Nylon Guys. My parents were definitely disappointed. I got my G.E.D., so they told me, 'You now have the year it would have taken to finish high school to pursue acting. I will not be nearly as lenient with my kids. You could argue that 'The Social Network' set the bar unreasonably high. It makes sense. But I'm not embarrassed by something like 'Mirror Mirror.' I did it knowing it's Snow White, and Prince Charming is inherently a saccharine, one-dimensional character. I did that movie to work with Tarsem Singh. As an artist, I got what I needed out of 'Mirror Mirror.' The results only feed an actor's ego. It shouldn't add or diminish from whatever experience you had while shooting.